10 watt low voltage light with 10&apos; cord that can be used underwater or in open air. Magnetic base. 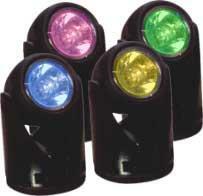 Includes 60 watt transformer and four egglite color lenses. A total of six 10w lights can be operated with the Egglite 60w transformer. The picture shows the lens color. Clear lens and four color glass lens set. 2 1/8 x 3 1/2 with base. Also available is a 20 watt light that should only be used submerged.